Many lacustrine systems, despite management efforts to control eutrophication, are hypoxic during stratified periods. Hypoxia is a major concern, not only for its impact on aquatic life but also for its potential to stimulate production of the greenhouse gases, methane (CH4) and nitrous oxide (N2O). We investigated the drivers of hypoxia in Muskegon Lake, a temperate dimictic freshwater estuary that experiences frequent hypolimnetic mixing due to atmospheric forces, riverine inputs, and intrusion of oxic water from coastal upwelling in Lake Michigan. Primary production and respiration (R) rates obtained from a δ18O mass balance model were similar to other mesotrophic environments (0.56–26.31 and 0.57–13.15 mmol O2 m−3 day−1, respectively), although high P/R (≥2 in mid-summer) indicated there is sufficient autochthonous production to support hypoxia development and persistence. The isotopic enrichment factor for respiration (εobs) varied markedly and was least negative in August of both sampling years, consistent with high R rates. Hypoxic conditions were associated with accumulation of N2O but not CH4, and emissions of N2O are among the highest reported from lakes. The average N2O site preference value of 25.4‰ indicates that the majority of N2O was produced by nitrification via hydroxylamine oxidation, despite the presence of resilient hypoxia. While it has been hypothesized that denitrification acts as a sink for N2O in hypoxic lakes, it is clear that Muskegon Lake functions as a strong source of N2O via nitrification. 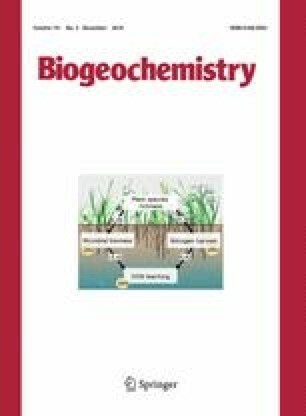 Further considerations of lakes as global sources of N2O thus warrant a closer evaluation of nitrification-fueled N2O production. The online version of this article (doi: 10.1007/s10533-016-0280-y) contains supplementary material, which is available to authorized users. Many thanks to Hasand Gandhi, Leon Gereaux, Adam McMillan, and Alex Dutcher for their assistance in the field and lab. This manuscript has benefitted greatly through feedback from Al Steinman and Steve Hamilton. This material is based upon work supported by the National Science Foundation Graduate Research Fellowship Program under Grant No. DGE1424871 to KRS, the Environmental Protection Agency Great Lakes Restoration Initiative Muskegon Lake Observatory under Grant No. GL00E00460-1 to BAB, and a Michigan State University Water Research Initiation Grant to PHO, NEO, and BAB. Any opinions, findings, and conclusions or recommendations expressed in this material are those of the author(s) and do not necessarily reflect the views of the Environmental Protection Agency or the National Science Foundation.